My Not-So-Young Adult Book Group at work will be meeting next week to discuss this non-fiction book for teens, which I just read over Labor Day weekend. I had heard of the Irish potato famine, of course, but knew very little about it. 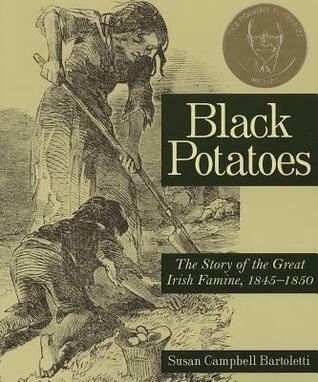 Black Potatoes tells the story of the famine and its causes, the response from the government, and the resulting emigration to the US and other countries. The author uses stories from affected families, collected from their descendants, which she intersperses with more general historical information. My only criticism is that a couple of times the author made statements that she didn't elaborate on, which I can only assume is for dramatic effect, but was not helpful. For instance, when talking about criminals being sent to Australia, she says "Once transported, people rarely returned." Ok, but why? Did they like it there? Did they die? Did they just not have enough money to pay for passage back home? In another spot she states that emigration from Ireland to the US and Canada had already been happening, but during and after the famine the numbers reached almost two million. I have no idea how two million compares to previous numbers though, and I suspect the teens this is intended for wouldn't either. But unless you're using this book to write a paper (which I suppose is entirely possible) these are fairly minor quibbles. Mostly I found it interesting and informative, if a bit depressing. (It doesn't help that I was also reading a book about a slum in Mumbai at the same time.) It was only about 150 pages long, and the text was accompanied by pencil drawings from contemporary newspapers, which I liked a lot. Visuals are always helpful with history, and it also broke up the text a bit. This isn't something I'd necessarily pick up just for fun, but I definitely learned some things with a minimum amount of effort.